Canon Océ Colorado: new UV-Gel technology and the future of large-format digital printing! We worked alongside the Océ R&D team to trial this remarkable new printer and pushed it to its limits. Whilst there were initially a few problems that we identified, we’re happy to say that Canon has worked through all of these and the machine that has now been released is certainly living up to all the promise. 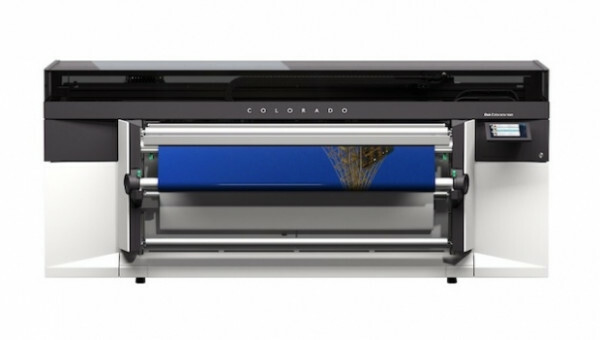 Without a doubt, the introduction of the Canon/Océ Colorado 1640 is the most exciting thing to happen in the print industry in a long time and is set to open up many new market opportunities and reshape the future of wide-format printing. The Canon/Océ Colorado 1640 has, of course, been engineered to the highest of industrial and technical standards and introduces many new and innovative features that offer finely-tuned automation, unprecedented productivity and a stunning overall performance across a wide application range - but the integrated technology that has caused such a stir in the market is its new and groundbreaking UV-gel ink-delivery technology system. 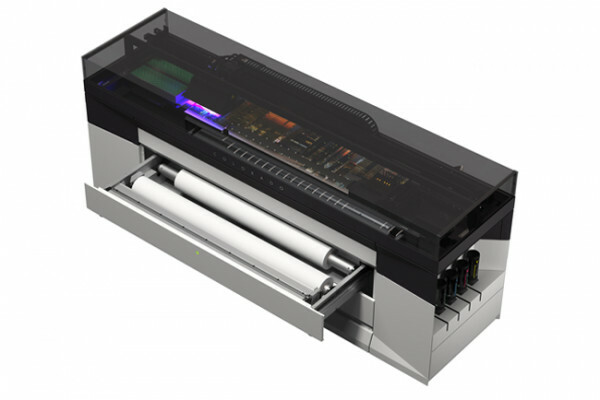 Here we have a revolutionary ink-delivery system where the ink-gel droplets cure independently with no ‘dot gain’ when the ink hits the surface; where the ink dries instantly through the employ of LED lamps; where the ink gel is odourless and as environmentally friendly as can be and where print performance delivers truly extraordinary density of colour and image sharpness. Here at Papergraphics we'll admit that we were seriously impressed and would be the first to agree that it does indeed mark the beginning of a new era in print and ink technology. From its rapid production rates and automatic compensating nozzles to its sheer industrial-quality build, in our opinion, this machine is a great piece of engineering, and is superior in so many ways to others in the 64" marketplace .... "and off the record, rumour is ... this is the first of a number of machines that will form the new UV-Gel range ... so if it's something other than a 64" roll-to-roll you're after .. watch this space". Our expert technical team are here to tell you all about it, answer any questions you may have, and we’d be happy to arrange a Colorado 1640 demonstration for you at our Application Centre in Crawley. If you’d like to know more or see it in action – just give us a call. Automatic nozzle adjustment to compensate for failed nozzles. Save time & reduce waste with the dual roll input with automatic media loading & unloading. Requirement to have a service contract, which is based on volume rather than age. Pricey compared to all other 64” large format printers in the market – but you’re getting a lot more for your money. Not as portable as other 64” printers … it isn’t designed to be wheeled around like other 64” machines & due to the weight and size, the machine is not as easy to install in hard to access spaces. Due to the complexity of the machine, the installation process does take longer than other 64” machines. The print process can leave a bit of a gloss sheen on some materials; however, our colour management experts are currently working on ways to reduce this and have already produced some great improvements. Unique UVgel technology: Canon’s outstanding UVgel print technology increases productivity and speed while using less ink and still delivering an improved colour gamut. Breakthrough productivity: Consistently fast output speeds and rapid job turnaround deliver productivity only previously possible using multiple roll-to-roll engines or a larger flatbed print engine. Outstanding quality: Non-toxic, durable and colourfast, the technologically advanced UVgel ink delivers instantly dry prints with excellent aesthetics, the widest colour gamut and precise sharp dots. Unrivalled versatility: Experience unrivalled flexibility to handle multiple jobs on one device. Print beautifully on the broadest possible range of media, even lower cost, thin or heat sensitive types. Low cost of operation: Enjoy the lowest operational costs in its class and an excellent return on investment thanks to reduced ink consumption of up to 40% and labour costs savings of about 30%. Fast efficient ink jetting: UVgel technology jets ink onto the media to deliver perfectly repeatable images at high speed. It prints at 159m²/hr for applications such as billboards or outdoor banners and even at 40m²/hr for the highest level of quality for close-up indoor applications.